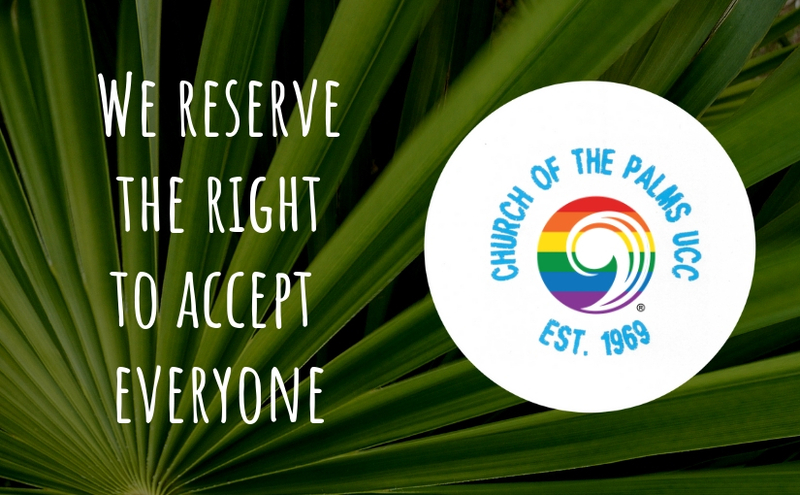 The Church of the Palms UCC – No matter who you are, or where you are on life’s journey, you are welcome here. Join us during Holy Week and Easter! Welcome to Church of the Palms United Church of Christ, a progressive Open and Affirming (ONA) Christian church in Sun City, Arizona. Sharing God’s unconditional love, justice, and extravagant welcome. Worship: Join us for the worship service on Sundays at 10 a.m. and stay afterward for fellowship and refreshments. View our Holy Week and Easter schedule. We’re located at 14808 N Boswell Blvd, Sun City, AZ 85351. Click the map below, then “View Larger Map” for a better view. You can navigate to us by clicking HERE. Church Bus: Need a ride to worship on Sunday? Click HERE. Visit our labyrinths – they’re open to the community! Rummage Sales: We’re rather famous in the west valley for our three-day rummage and bake sales held every March and October. Music Ministry: Whether you are a singer of songs, a player of instruments, or a joyful listener, the ministry of music at the Church of the Palms is for you! Learn more HERE. Read our Statement of Faith and Purpose.